The leader of the National Front participated in her first Conference of the Presidents of the European Parliament this Monday (29 June). The meeting was marked by a heated exchange between Marine Le Pen and Juncker. EURACTIV France reports. The Conference of the Presidents of the European Parliament welcomed its newest member, Marine Le Pen, on Monday (29 June), during an emergency meeting on the Greek crisis. 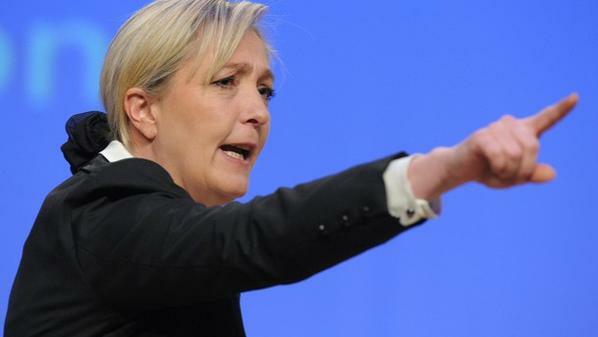 Since successfully forming a political group on 15 June, called Europe of Nations and Freedom, the leader of the French extreme right party has earned her place at the table with the EU’s leading politicians. The Conference of the Presidents has some important powers in the European Parliament, including setting the institution’s agenda and work programme, and deciding whether or not to open committees of inquiry into certain issues. The first meeting to include the National Front leader was also attended by European Commission President Jean-Claude Juncker. This clash of characters did not go by without incident, Parliament sources told EURACTIV. “There were some very heated exchanges,” our source said. Marine Le Pen unleashed anti-austerity tirade and insisted that the cash flow to Greek banks be kept open until the referendum. The ECB has already promised to continue lending to Greek banks, whilst refusing to increase the current level of financing. Jean-Claude Juncker, who was invited to participate in the meeting, reportedly gave a characteristically scathing reply. The President of the European Commission had just given a long speech to the press, in which he said he was particularly hurt by the crisis and felt “betrayed” by the Greeks. This heated exchange, kept firmly behind closed doors, was not hinted at in the conclusions of the Conference of the Presidents, which were circulated shortly after the meeting. “Today the European Parliament’s Conference of Presidents (EP President and political group leaders) discussed the latest situation on Greece with Commission President Jean-Claude Juncker,” the official document states. “The Conference of Presidents then discussed the situation further and adopted a position on the immediate next step that should be taken. The Conference of the Presidents is made up of the presidents of each European political group, the president of the European Parliament and one non-aligned MEP, who can take part in the meeting but has no vote. Decisions are taken by consensus or put to a vote. The weight of each vote is proportionate to how many MEPs the president represents. The Conference of the Presidents organises the European Parliament's workload and its relations with the other institutions. It is also in charge of the agenda for plenary sessions and the allocation of speaking times for members during these sessions. The presidents also decide on the composition of the parliamentary committees: how many members they should contain from each political group and which subjects they should address. Finally, the Conference of the Presidents must approve any own initiative reports that come out of the committees. The winner of the Sakharov Prize is also chosen by the Conference of the Presidents, from a list of candidates put forward by the Foreign Affairs and Development Committees.